This ALLURING eXclusive glue is designed for volume 3D, 5D, 6D lashes. It also works great for normal lashes as well. 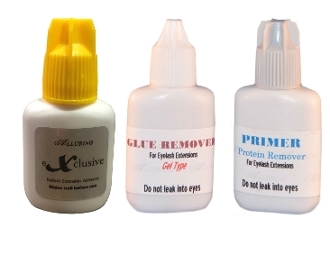 This glue has little fumes and fast drying time of 1-2 seconds. This glue has perfect viscosity which is great for making "fans". This also creates flexible bond when dried. This glue offers strong bonding power and drying power. The setting time is very fast & the bonding time is up to 5-7 weeks with proper application & client care. Glue should be shaken well before use. Blow lashes for five minutes following application or till lashes are completely dry before allowing your clients to open eyes. We recommend that you keep glue in refrigerator or somewhere cooler than room temperature for a longer storage life. If glue is kept in a refrigerator, it is required to be left out for about 1 to 2 hours before use. For professional use only. Do not use on yourself. Disclaimer: We are not responsible for the misuse of the glue. You are solely responsible for the product once you purchase it from us. Performance and results of glue vary from person to person. If you purchase glue with high fumes, you must know how to avoid irritation and inflammation if it occurs.